House of Cards could be soon returning to production following the sexual harassment and assault allegations made against its star, Kevin Spacey. The hit Netflix show was forced to take a break following the claims and Spacey has now been dropped from the show. Pauline Micelli, senior vice president at the show's studio, Media Rights Capital, recently wrote to staff to say its hiatus was being extended. "We continue to work with Netflix with the hope of resuming production soon." Crew on the show will be paid until 8 December "as we continue these discussions," her letter went on. Netflix previously announced it "will not be involved with any further production of House of Cards that includes Kevin Spacey". Ms Micelli's letter addressed how stressful a period it had been for everyone working on the show. "These last two months have tested and tried all of us in ways none of us could have foreseen," she wrote. "The one thing we have learned throughout this process is that this production is bigger than just one person and we could not be more proud to be associated with one of the most loyal and talented production cast and crews in this business." In the letter, published in the Hollywood Reporter, she added: "Our hope is that the entire crew will be able to reconvene when production resumes. "But we want you to know that we will certainly understand if crew members need to find other work in the interim, which will prevent them from re-joining us. We sincerely appreciate all you have done". She said that the writers would be continuing their work during the hiatus - presumably working on how to write Spacey out. Spacey, who was artistic director at London's Old Vic theatre, is currently being investigated by Scotland Yard over two allegations of sexual assault. He also faces claims of "on-set sexual misconduct" by members of the House of Cards production crew. Initial allegations about Spacey were made by actor Anthony Rapp in October. 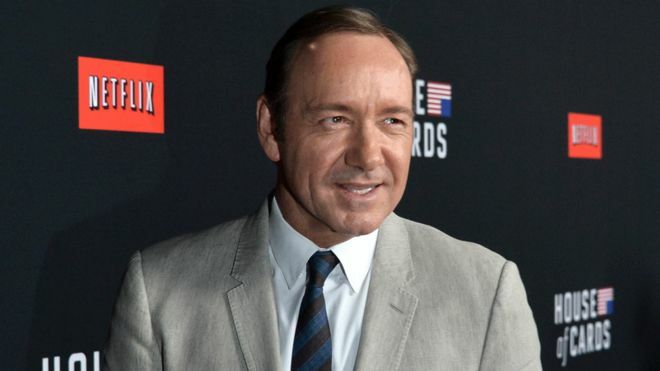 Rapp said he was 14 when Spacey allegedly harassed him following a party in 1986. Spacey claimed to have no memory of the alleged incident while offering an apology to Rapp "for what would have been deeply inappropriate drunken behaviour". The Old Vic has said that an internal investigation found 20 people claimed they had been the victims of inappropriate behaviour by Spacey, who was at the theatre between 2004 and 2015. A spokesperson for Spacey said the Oscar-winning actor has been "taking the time necessary to seek evaluation and treatment" since the allegations surfaced.